The deadline to protest is May 15. AUSTIN, Texas — Travis Central Appraisal District (TCAD) will mail appraisal notices to property owners this week. Approximately 438,000 notices will be sent. 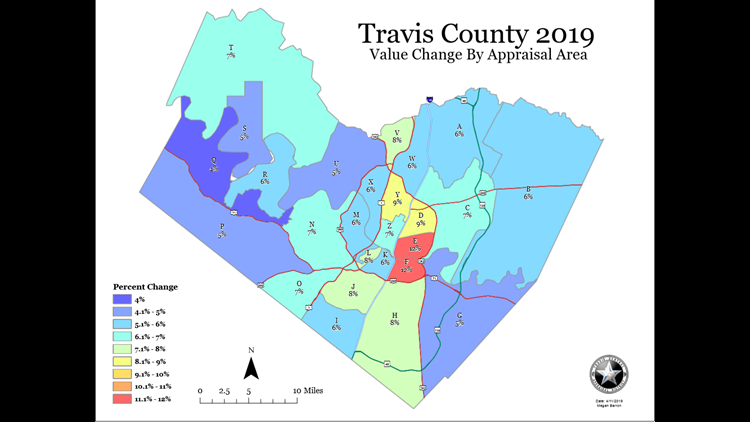 About 30 percent of all property owners in Travis County will not get an official notice of appraised value. Instead, they will receive a postcard from the appraisal district because their value increased less than $1,000. According to TCAD’s data, properties east of I-35 and along Highway 183 increased the most, increasing by 12 percent. Overall, preliminary taxable values increased from $188 billion to $213 billion. Commercial value led the increase of 16 percent (aggregate). The median homestead taxable value went up 7 percent to $275,112. More than $3 million of taxable value was added to the rolls in new home sales. “Commercial development continued to boom in Austin in 2018, as the strong economy drove job growth and opportunity,” said TCAD in a release to KVUE. “Major tech companies continue their drive for growth, and Austin has emerged as one of a handful of cities most attractive to the industry for expansion, and tech companies Apple, Google, Oracle, Facebook and Indeed continue to expand their operations in the Austin market. RELATED: Texas ranks among the highest for property taxes across the U.S.
You can view your values on the TCAD website. Hays and Williamson Central Appraisal Districts were also mailed to property owners. Click here for Hays CAD information. Click here for Williamson CAD information. The deadline for all protest is May 15.